Barefoot Preston and the New England Barefoot Runners organized a tremendous pre-Marathon fun run with Chris McDougall and other barefoot rockstars. Chris was in town with Born to Run: The Naked Tour, “a nationwide celebration of running’s bare essentials” and promo for the paperback version of the book that started me and most other barefoot runners. The weather was less than stellar, but cool for running. We gathered at Marathon central on the steps of the Boston Public Library. Two days before the big event, the town, particularly the Back Bay, was buzzin’ with runnin’ fever. Chris blew in with a bang, just before noon. At 6 foot 4ish with shaved pate and Hollywood smile, he’s not hard to spot. He’s about the most positive, engaging guy in the world and quickly whipped the crowd into a barefoot froth. After a little time with reporters and cameras, he pulled everyone together and introduced a number of other notables from the community: Tony Post, the Vibram CEO. 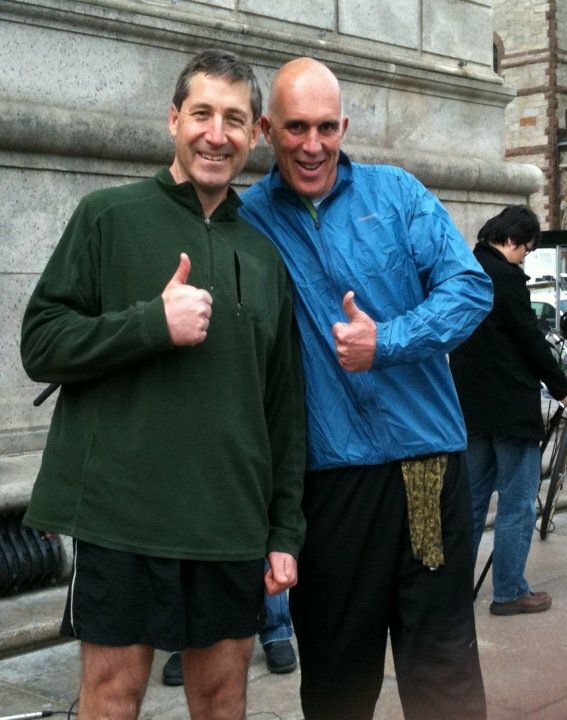 Michael Sandler, the amazing (amazing cause he can run 50 miles—fast—with a titanium femur in his 1” shorter leg) author of the first barefoot how to book. Scott Jurek, 7 time winner of the Western States 100 mile ultra marathon. Lee Saxby, superstud running coach. Jeffrey Ferris, the local grandpa of barefoot running, with 42 years under his belt. And others. Harvard’s Dan Lieberman, the barefoot mad scientist, showed up at the finish line, perhaps saving strength for his 26 miles on Monday. I was actually surprised at how few bare barefeet there were. I’d estimate 10% barefoot, 60% Vibrams and other minimalist shoes, and 30% traditional shoes, even after Chris talked some folks out of their shoes. The barefoot amongst us drew a lot of attention from reporters and interested, questioning bystanders. More than one press photographer asked to shoot my feet (and me without my pedi) though my Googling has not yet turned up any evidence. Even during the run I had several Q&A sessions with shod runners. 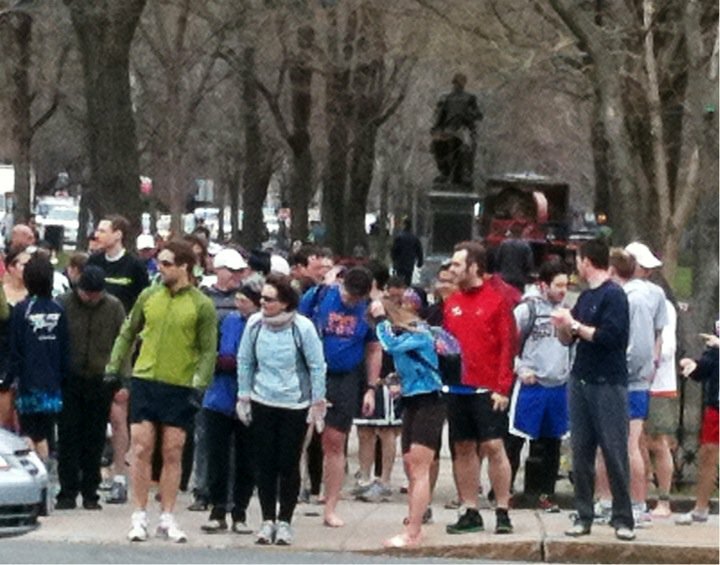 About 100 of us set off for an hour’s jaunt along Comm Ave and then the Charles. It was truly a fun run, everybody taking it very easy. Ten or twenty of the gang were warming up for Monday. What a hoot it was to finish at the Marathon finish line. Amazing how many people were there snappin’ pics and getting psyched for Monday. It was a nice chance to chat with barefoot brethren. Michael Sandler shared a few tips. Tony Post intimated to me that he occasionally drops the Vibrams and goes naked. I learned Dan Liberman’s secret recipe…Duncan Donuts blueberry muffin carb loading two days before race day. Due to poor parking planning and dearth of quarters I couldn’t stay around for the workshop in the library’s Rabb Auditorium. I’d heard many of these guys speak before, but wish I’d known and planned. Nonetheless, it was a one best barefoot running experiences. Thanks Preston, Colin and Jim for pulling it together, and to Chris and the rest of the gang for making it special. 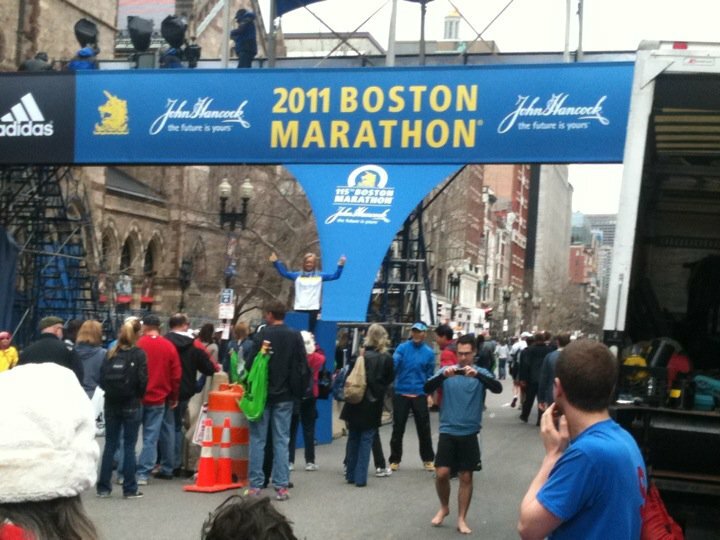 This entry was posted on April 17, 2011 at 7:37 pm and is filed under Barefoot Running, Experience, Other Runners. You can subscribe via RSS 2.0 feed to this post's comments. Looks like a really fun time! In the Dominican Republic where I live, there is a pretty small barefoot/minimalist community. Last 10K I did there were 4 of us in Vibrams, and a few runners from Haiti in very thin soled shoes. Can’t wait for my “winter” here when the concrete cools down a bit and I can ditch my Bikilas more often.